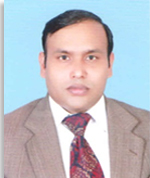 Punjab University, department of Microbiology and Molecular Genetics (MMG), Assistant Professor; Dr. Imran Sajid has been awarded Fulbright postdoctoral fellowship 2018-19 by USEFP. The fellowship award is for one year postdoctoral studies at USA. Dr. Sajid will complete his postdoc at the Center for Pharmaceutical Research and Innovation, Drug Discovery Division, College of Pharmacy, University of Kentucky, USA.